The Salvatorkapelle is called "chapel", but actually rather a church - and probably one of the oldest churches in Vienna, at least at its core. It was built as a house chapel for the wealthy burghers of the Neuburg family in 1298. It is likely that the knights Otto and Haimo were benefactors of the Salvatorkapelle; Otto was the nemesis of Duke Friedrich der Schöne and participated in a revolt against him. As a result, he was anathemised. In 1361, the Salvatorkapelle was extended and modernised. After it was re-opened, the name "Liebfrauenkirche" ("Church of Our Lady") became common, but in the early 16th century - a time when the church got increasingly under pressure through reformist movements - the name "Ottohaymkapelle" came up. This was a problem for the church and classified as heresy. In 1515, Pope Leo X himself gave orders to re-name the chapel with pomp and circumstance into "Salvatorkapelle", after a statue of St. Salvator that occupied a central location of the little church. In 1373, the Altes Rathaus City Hall had been built "around" the chapel; when the chapel was extended in the 16th century, it gained a second nave in a room that had previously belonged to the Rathaus. Rather bizarrely, the second nave is higher and more "Gothic" and delicate than the older, smaller one. 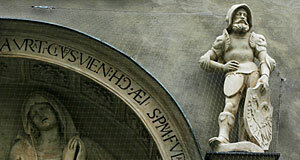 The extension of 1520 also added the most valuable part of the Salvatorkapelle - and the only one that can be seen around the clock: The Renaissance entrance portal, decorated with stone knights, ornaments in the style of Lombardy masonry and the inscription "Consecrat Salvatori Nostro Jesu Christo". The interiors of the Salvatorkapelle were upgraded to Baroque in the 18th century, which added even more to the lack of uniformity. To make things worse, the pulpit of 1756 is considered to have neo-Classical elements to it. Damages that occurred in the course of WWII were fixed over the course of the past decades. In 2007, the Renaissance portal of the Salvatorkapelle was renovated. Since 1871, the Salvatorkapelle is used by an Episcopal community ("Altkatholiken") and usually closed for the general public. Visitors can get inside the chapel during and after services. Note that you have to access the chapel through the courtyard of the Altes Rathaus - which is the nicer route anyway, since you get to see the Medieval/Baroque building and the Andromedabrunnen, a Baroque fountain by Georg Raphael Donner from 1741. Attractions nearby are numerous - to name but the most immediate ones: The church Maria am Gestade; the Böhmische Hofkanzlei; the Hoher Markt square and Vermählungsbrunnen; the Stadttempel, the church St. Ruprecht and the Kornhäuselturm; as well as the Börse Stock Exchange.